First thing is, what you think you already know about engagement ring etiquette, you probably do. That is, tradition – the guy (we’ll call him “groom” from here on out) traditionally pays for the gal’s (bride’s) engagement and wedding rings, and the bride traditionally pays for the groom’s wedding band. Traditionally, the groom pops the question on the unsuspecting (or seemingly unsuspecting) bride, and proceeds to open a velvety box containing a beautiful ring topped with a not-too-small and not-too-large diamond. Traditionally, the bride pays for a simple, yet elegant gold band for the groom. But we all know times have changed since these antiquated traditions. What is acceptable? Tradition is tradition, and it won’t go out of style for the guy to surprise his bride. It is still perfectly acceptable for the groom to choose and pay for the engagement and wedding rings and present his beloved with that velvety box. Very few women, if any, would say that this is not how they wanted their wedding proposal. It’s classic and romantic. If your guy opts for this method, give him some props, ’cause this is almost risky these days! It is also perfectly acceptable for the bride and groom to shop for the engagement ring together. The bride may pick out a few from which the groom can make a final decision, or they may pick out the final choice together. Or she may drop some subtle or not-so-subtle hints so that he can surprise her later (and if he was actually paying attention, it will definitely be a surprise!). Nowadays the bride and groom can also opt to co-pay or split the payment. You are, after all, entering into a new financial arrangement with this wedding business, so it makes sense to talk finances from the get-go. Or, as Britney Spears showed us, it also happens sometimes that the bride pays for the engagement and wedding rings, although apparently the tabloids frowned on this, so the etiquette jury is still out on this one. Now for question on the minds of all brides to be: What do you do with the engagement ring during the wedding ceremony? Traditionally (here we go again), brides have opted for a couple of solutions. Take your pick. First, you can wear the engagement ring on your right hand during the ceremony, then replace it on your left afterwards. This is why the wedding ring is seen on the inside of the finger. Another option is to keep the engagement ring on the left hand, remove it during the ceremony, and then replace it. Again, this leaves the engagement ring toward the end of the finger. 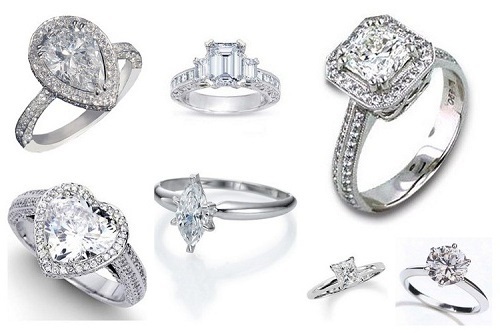 Some women choose not to wear the engagement ring after the wedding. This one is easy: Remove the engagement ring prior to the wedding ceremony, and don’t think twice about it. Should the engagement be called off prior to the wedding, you must use your best judgment on whether or not to return the ring. If you split the cost, you’ll maybe want to keep it or sell it on eBay. If he paid for the ring, you may decide to return it (it’s a constant reminder), or … if he was a jerk, you may want to re-think eBay.